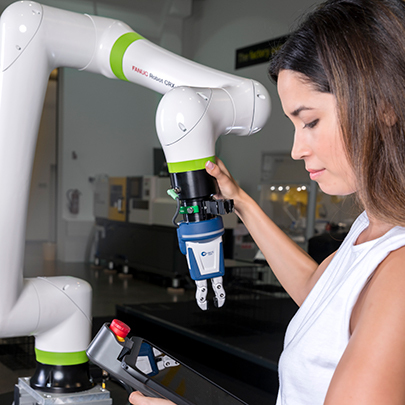 The FANUC collaborative robot hand guidance function makes teaching your CR-35iA collaborative robot easy, without the need for conventional programming. This method of robot teaching allows you to simply hand guide the robot through motion paths. The hand guidance not only features the teaching function but provides you with the flexibility to intervene manually in robot programs. 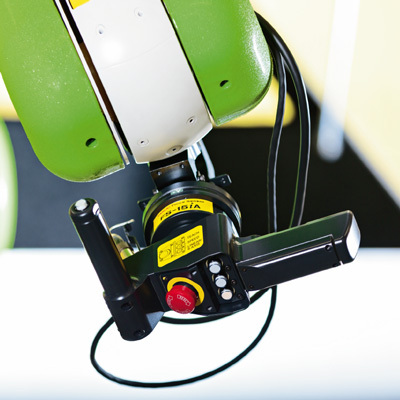 Once a program has been completed, the hand guidance feature also allows you to influence the manual handling of the gripper or workpiece. That’s what we call manufacturing efficiency. With just a few pieces of additional hardware, you can use the hand guidance teaching to train your green CR-35iA collaborative robot by hand. 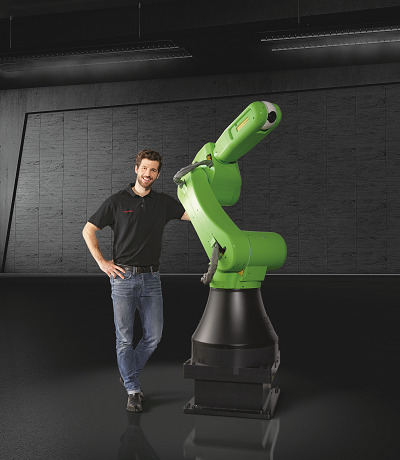 The attachments also allow you to use robot as a handling tool. The hand guidance function enables untrained staff to carry out simple positioning or re-programming on the job. That way, if a task changes, operators are able to intervene immediately and keep re-programming time to an absolute bare minimum. 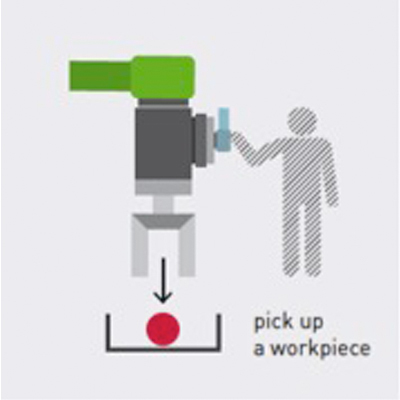 With the help of the hand guidance function, you teach the collaborative robot to lift heavy parts, or handle dangerous goods, preventing humans from ergonomic injuries. You instruct the robot to perform different tasks by simply hand guiding it to pick up a part and move it into the desired position following a path. To teach a robot points or a path you simply lead the robot through the desired motions using handles mounted on the robot wrist, pushing the “teach switch” to confirm the movements. The new collaborative robot hand guidance function reduces the need for staff trainings, making the robot even more cost effective.